Imperial authorities are careful to control what knowledge is shared with the citizenry. Word of Imperial victories are lauded as proof of the Emperor’s greatness and of the wisdom of His Imperial servants. News of military defeat, rebellion, or corruption is ruthlessly suppressed. Still, rumors spread quickly through the citizenry, particularly among the oppressed and embitered who toil in the underhives of the Imperium’s great urban centers. Most of these rumors are untrue, or carry only a hint of the truth. Yet, like a cancer, they can eat away at public confidence and serve to destabilize an entire Sector. Here are the stories being told … as of 3 845 736.M41. The ruined city of Ungoloth, an abandoned hive city on Morkai where the Haruspex is rumored to still rule over a vast army of mutants. On the world of Morkai, the ruins of Ungoloth have been shunned by Imperial authorities for centuries. It is said that no one has ever returned from visiting this abandoned Hive City, infested with mutants and worse. Yet rumors have spread recently that the Haruspex—or someone claiming the title of the mutant leader—is stirring up the populace of this cursed city and sending marauders out to raid the northern desert tribes. This is a worrisome development, as the Haruspex led a rebellion against the Council of Electors more than three centuries ago—and more than 1 million died in that war. It is said that the worried Electors have dared to send a new, heavily armed expedition to the Ungoloth—but nothing has been heard of this expedition for weeks. It’s not unusual for merchant vessels to be lost as they traverse the Warp. Yet an unusual number have disappeared recently along a major shipping lane on the rimward side of the Corvus Cluster. A source at the Imperial naval base at Belliose claims that a naval task force also has disappeared in the region, which falls between two uninhabited star systems: Stigmata and Dryilian. It is said that Imperial authorities are considering an Edict of Vetitum Locus, prohibiting all Imperial shipping in the area until the Imperial Navy determines the reason for the mysterious disappearances. A small space hulk was spotted by a merchant vessel, The Maersk, traversing the Oisan Subsector six weeks ago. The suggestion that the hulk could be the notorious Shard of Damnation was based on the size of the hulk—approximately 5 kilometers long. But the merchant vessel did not have a sensor array capable of determining if the hulk had an atmosphere on its surface—a mysterious phenomenon of the Shard that would have confirmed its identity. Wisely turning and accelerating away from the space hulk, The Maersk survived to report its finding to Imperial authorities. No word on whether the Imperial Navy has investigated the sighting. Small settlements on several agri-worlds have been raided—with hundreds of Imperial citizens rounded up and taken away on shuttles. A few survivors of the raids, who managed to hide and avoid capture, described the raiders as heavily tattooed humans who spoke a garbled dialect of Low Gothic. This matches the description of Balar Slavers, who have plagued the Corvus Cluster for more than a century. The last major raid by Balar Slavers was two years ago on the world of Talaara, an attack foiled by the Rogue Trader, Adeon Drake, whose crew boarded the Slavers’ ship and rescued hundreds of prisoners. 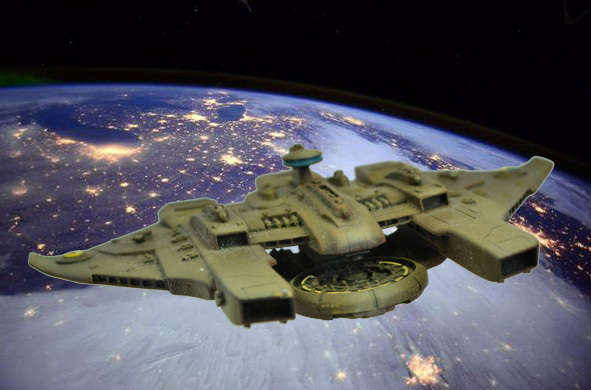 A battleship-sized xeno vessel was spotted over Media III, but it later departed the Sculptor System for regions unknown. A flotilla of Tau warships, including a heavy cruiser and squadron of gunships, was spotted entering orbit around Media III in the Sculptor System. The growing xeno presence in the Sculptor System is seen as a direct challenge to the Emperor’s rule—and raises the worrisome prospect that the Tau plan to break the Imperial Navy’s blockade over Dar Sai, where a Tau invasion army continues to threaten Imperial rule. One of the more prominent members of the Belliose aristocracy, Count Johaan Feracci, has been awarded the Order of the Beneficience for a decade of charitable support of the poor. The patriarch of House Feracci, the most powerful and influential trading house in the Sector, was feted at a banquet of 5,000 aristocrats that featured planet-wide fireworks and the symbolic gift of wine and fruit to the masses. Regrettably, a delay in the distribution of these gifts sparked a rude display by laborers who waited outside the banquet hall for hours before losing their patience. As the crowds grew restless and noisy, a battalion of Arbiters arrived and dispersed the crowed with gas and riot guns. TheGM—Rumors of the Underhive may become a regular feature of the Corvus Cluster—a series of random rumors and intelligence reports that any Imperial citizen might hear as they slave away in the manufactorums of a Hive City. These rumors serve a variety of purposes. For one, they provide me the opportunity to ponder “out loud” some ideas for future adventures in the Corvus Cluster. They also offer an opportunity to hint at coming events. I fully expect many of these rumors to prove unfounded—or, more accurately, I’ll never get around to doing anything with them. But—and this is important—rumors are part of any human society, so sharing a number of tales and stories on occasion reinforces the idea that the Corvus Cluster is “alive,” a vast and complex region where billions of sentient beings compete for power, survival, and the hope of a better tomorrow. Of course, in an age where “there is only war,” a better tomorrow is a very unlikely outcome. The Corvus Cluster is a Warhammer 40K blog that documents our tabletop adventures in the sci-fi universe of Games Workshop.